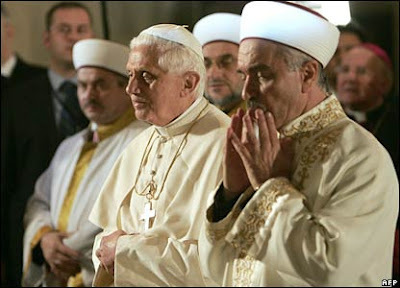 Benedict XVI has replied to the letter sent on 13 October by 138 Muslim scholars. In his response the Holy Father invites Prince Ghazi bin Muhammad bin Talal, who was behind the initiative, to visit the Vatican with a delegation of signatories, the latter to continue their dialogue with the Pontifical Council for Inter-religious Dialogue. In his reply, which was released today by the Vatican, the Pope reiterates the importance of dialogue based on actual respect for the dignity of the person, on objective knowledge of the other's religion, on the sharing of religious experience, and on a joint commitment to promote mutual respect and acceptance. The letter also mentions that in the Pope’s Encyclical Deus Caritas Est (“God is Love”) stress is placed in particular on the twofold commandment to love God and one’s neighbour. Lastly the Pope invites the prince and “a restricted group of signatories” to visit the Vatican. Likewise he opens the door to them for co-operation and working meetings with the Pontifical Council for Inter-religious Dialogue and other Catholic institutions like the Pontifical Institute for Arabic and Islamic Studies and the Pontifical Gregorian University.